Ensuring a quality fuel supply is integral to a properly functioning biomass boiler system. 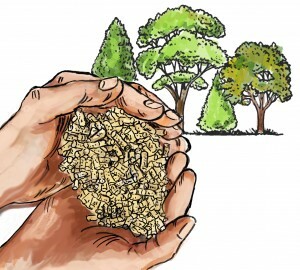 Evergreen has extensive knowledge of the biomass industry and has close ties with wood pellet producers and wood chip suppliers to ensure high quality fuel for your heating system. Depending on your needs, fuel supply contracts can be arranged for the short or long term. If you are producing your own fuel, Evergreen can recommend high quality chipper suppliers and can evaluate your fuel supply. Whichever arrangement you opt for, Evergreen will take the hassle out of your fuel supply. If you would like to remove the issue of financing and fuel supply completely, let Evergreen build, own and operate your biomass heating system and simply sell you the heat! Many businesses lack the funding necessary to convert over to a green energy alternative and are hesitant to take on risk. Evergreen eliminates the risk and financing issue by offering a standalone heat energy contract. Evergreen can install, own and operate boilers at your site and simply sell you heat at a cost less than your current heating costs—guaranteed! Within the contract includes all fuel , maintenance and emergency call outs . The customer only pays for the heat they used based on an energy equivalent basis. This allows our clients to make the transition to carbon neutral biomass heating without diverting precious capital away from core activities. the need for costly engineering and building retrofits. The containerized systems are delivered to site, assembled, integrated with your existing heating system and commissioned to deliver carbon neutral heat ready with the turn of a key. Are you ready to switch to a biomass heating system? Evergreen BioHeat can make your new system come true easily and affordable. Evergreen offers the highest quality European boilers at the lowest prices possible matched with outstanding service and care.